One of my favorite parts of fall is the squash. Anyway you have it, I'll love it. 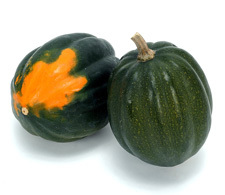 Soup, salad, roasted, or pureed, I love squash. So when for lunch today all I had left in my pantry was an acorn squash, I was not at all disappointed. I was, however, a little perplexed as to how to cook it seeing how my oven mysteriously stopped functioning. Thank God for my heavy duty shallow fry pan I bought at Bed, Bath, and Beyond. Here's my recipe for a smoky, sweet variation of roasted acorn squash. -you can do this in the oven on 400 degrees if your oven actually works! -if not, make sure to used your thickest bottom pan with a tight-fitting lid. -1/2 tsp each of paprika, cumin, and salt and pepper. I've never thought of pan-roasting squash before - thanks for the tip! I'm sure it would be lovely puréed into a soup with a little pancetta on top.